I am definitely not taking any crazy pills (today, at least): this is totally the mid-engine Chevrolet Corvette, people. What the hell else could it be? The windows are certainly very Corvettish. So are the headlights and the tail lights. 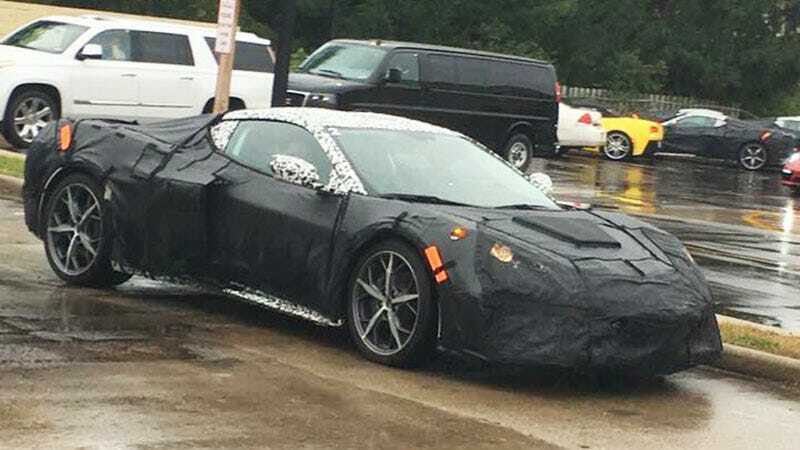 I don’t recognize the wheels at all but, hey, they could be brand-new MID-ENGINE CORVETTE SPECIAL EDITION WHEELS. The photos come courtesy of Jake Vandermoon and Josh Busenbark. The mule was spotted at a McDonald’s in Cadillac, Michigan. Busenbark said that the mule is “all over northern Michigan today.” Readers, if you’re in that area, keep your eyes peeled, you might see this unicorn running about. It’s true that there are many suppliers and testing facilities near Detroit and that this mule could belong to any automaker. But it doesn’t look like a Ferrari to me, I don’t think it’s a McLaren and it’s probably not a Ford. I think it’s the mid-engine Corvette because I am a dreamer. I want it to be so. Following procedure, we have reached out to Chevrolet for comment, but don’t actually expect a confirmation or denial. We will update if we hear back, however.